I praise magnify and adore the LORD with other brothers and sisters in a small storefront building . The building sits in a small Florida town . It faces south to a railroad track and west to a park. The park surrounds a small pond . In the park ,a statute of Ray Charles sits immovable like a royal guard . Day and night brother Ray is poised playing a piano . Ready to strike notes we never ever hear . His head is tilted slightly upward as a reminder that something blind ,weak, and insignificant became insightful and strong right here in Greenville Florida. “That’s not really Ray Charles ” we teach the young ones . “it’s just a thing to remind us about him” we say. The stories rumble from the ground with every passing train. Out and over and in the building where I worship there are dramas . Many twisting and turning tales of faith filled fights that became healings of bodies and minds and spirits. They are valiant stories. Stories of folks pulling out the Sword to cauterize addictions. They are gentle stories . Stories of full grown folks becoming children again in the arms of “Abba” “Daddy” their God and Father . (2) There are volumes of stories on the shelves of time in a spiritual space . 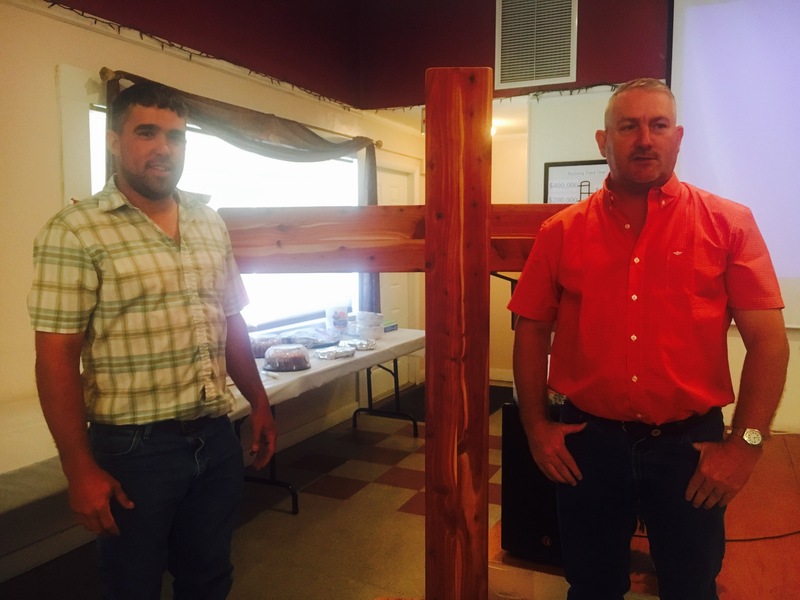 A story about a wooden cross first began for me ,in my living room, where a remnant of my church family first met. . We were meeting 50 miles away from Greenville . We came from many places together in a place that had no name. But, God gives everything a name. So ,one day , He gave a name for our meeting to a young man . (3) The young man was so excited to have the name that he wrote it inside a big Bible dictionary. He wrote ” to the church of the Tuesday nights” It was easy for us to live up to that name. We met Tuesday after Tuesday night. And, when we invited folks to come, they always remembered what night to come by our name. In the “church of the Tuesday nights” , Brother Chris preached and teached behind a flowery green end-table topped with a cross and his bible. We bent our kness on a green rug and we believed with Jesus for everything God promised. That was a story from long ago. Pepsi stains and watermarks speckle both table and cross now . They stand tucked away in a small room silently speaking a story better than my writing could ever tell. They gather dust like ashes while I drive to Greenville on Sunday morning. When we moved to the building in Greenville, we did not have a table or a cross. It was all new because Pastor and his family were bringing something new to Greenville. He had a podium for his bible and a new name for his meeting. We didn’t have a cross and we weren’t called a church. We were named “Renewed Life Outreach Center”. I thought a lot about why it might be named “center” and not “church”. I was old thinking when I was younger. And in those days I always would give questions to heaven where answers either come down or where the question would be held hostage. It was before I learned to TRUST. This particular question was kept hostage with no earthly answer. But when I prayed I had to call it something. So, with Jesus I called it “His church”. (4) But when I was around folks, I would forget the name so often that I would call it silly names like “skeeter hawk revival” . And sometimes ,when I wrote a check, I would write “Renewed Life Outreach CHURCH”. But God , in His mercy, would not let me hurt my head thinking about why we weren’t called church too long .He held the question in His heavenly grip and slowly released an answer to me. He began speaking first, in Corinth where Paul first had “church”. 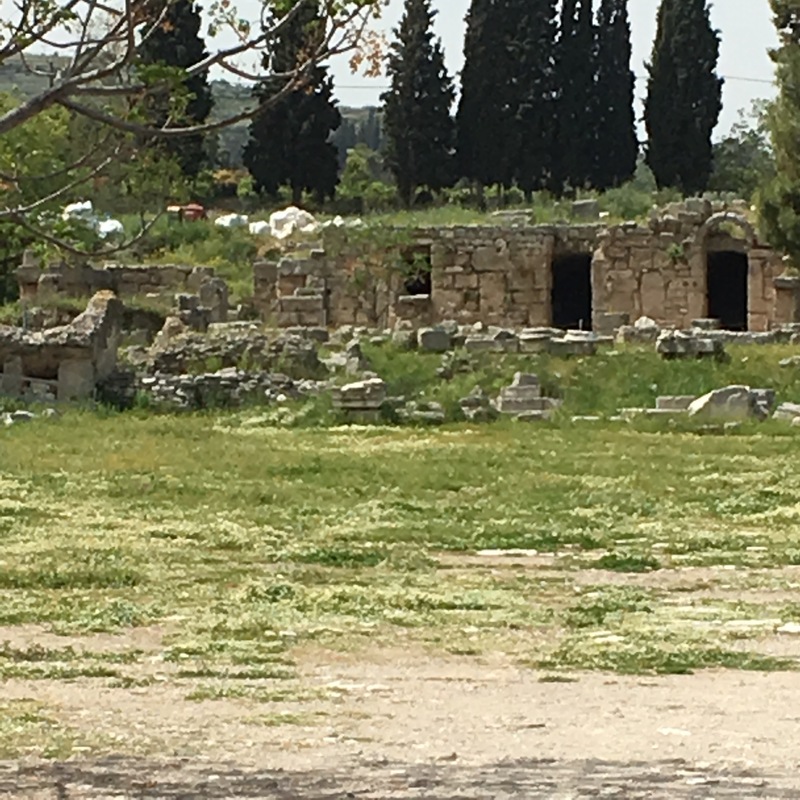 He took me there where I saw how the apostle Paul set up a place to meet right in a center of the town of Corinth . It was an open storefront and just like my “church” , it was first used as a market . No one in Corinth that I met could tell me what Paul called his church . At least they could not tell me what it was called before Paul wrote to us “the church of God in Corinth”. (5) Maybe he called it a “meeting place” they said. Folks made signs with their hands of the cross 200 years before they drew them .It really wasn’t until the 4th century that a cross was first brought visible as a display of faith. Constantine abolished crucifixion as was practiced in Rome and brought forth the Cross as a display of this victory. They say that brother Constantine might have had the right spirit about the work of Jesus’s particular cross. He knew the Spirit spoke that Jesus physical cross was used victorious over the devil and death. But the Devil took Constantines thinking away from the Spirit of the cross and had many people killed who didn’t see the cross in the way Constatine did. The Beauty of the cross mixed again with Bloody sinners in the Crusades and became a message of death and slavery. It wasn’t four hundred years but, just four years that Renewed Life Out reach church was without a cross. It did not seem like four years. It just felt like we were as Paul’s Corinth church. And it wasn’t for lack of believing in the cross. The whole mission of RLOC was “birthed out of the desire to see Gods people walking in and possessing all that was purchased for them by Jesus’s death ON THE CROSS” http://www.facebook.com/RenewedLifeOutreachCenter . Similarly ,a sign outside our building was wooden with a painting of a purple cross and our name. “Where’s your cross” a visitor asked. I held the cross on my neck. “No I mean a real live cross. You should have one” she insisted. “we believe in the Jesus’s work on the cross”. I said , reciting something I heard a pastor once say. She looked at me , then looked again around the room as if for a lost best friend. She then hurried out the back door facing the railroad and never came back. She eventually found her friend . She found her friend in a place where a cross hung from a ceiling in a big church with colored windows. Even though I was settled that we didn’t need a cross, I would sneak to chapels with colored windows late at night to pray alone and see a cross . And always, In RLOC, i might see the cross on the video screen from the back door on cloudy Sunday mornings . As the four years passed, I would see more and more crosses everywhere. I would see crosses on necks , in pictures on walls, on tattooed arms, ankles and chests, as screens on computers, hovering over churches, in the hands of the dying. Every day I saw them more and more peeking through bushes, as clouds in the sky, as breaking beams of sun, in cracks on side walks, on lattice windows and doors, even in prison gates. One day, on Good Friday, I made a cardboard cross and took it to the park where Ray Charles sits ever so still . I wanted everyone to see the cross . Crosses were every where in those years. And on top of that , Pastor was preaching like Paul every Sunday ,for all four years, the message of the cross. https://soundcloud.com/vunglaub/sets/the-kingdom-of-his, a playlist on #SoundCloud. The cross was a tool to see our Savior and not a trinket to throw on a night stand or hang on a wall. He had us look at every angle and side of the cross that could be seen. We looked so much at crosses our eyes felt splinters. Even some felt nails in their hearts and crowns on their heads. Everyone felt the work of the cross in their own individual way . But not many talked together about it. We just talked of hunting and knitting, eating and fasting, working and retiring, if we talked at all. And we were a lot like that church in Corinth. Each one walking his own way. But then, in the 4th year, on April 2nd , something began to change. It was Sunday during the first worship song . Some were singing aloud , some were singing silently, some did not sing. Some had eyes open. Some had eyes shut. Open or shut, our eyes were chosing to see other people or problems or pain instead of the power of God. But, we centered our stance toward a podium or a screen expectant of something greater than ourselves . As the first song played, our eyes were everywhere. There was not central place to set our eyes. There was no object that we all could converge on . Some were upward expectant at ceilings (9) , some downcast at the floor (10) . Some looking at the podium, some the screen. Some with eyes in the back of their head staring at the man or woman across the room. Eyes were all over. Inward and outward. Eyes making judgement about what they saw. But , that Sunday , when Houston and Roland wheeled the cross through the back door, all eyes turned to them and turned to the cross. “So Houston I gotta meet with you to find out about that cross” I said to Houston later that Sunday. “okay ” he said. “I bet you got a story about that Cross ” I said in great anticipation. “I guess “he said drying off from his baptism. Houston stared at me in silence perhaps wondering if I would let him answer. I stared back trying to hold back more questions. “Okay Houston. That’s it “I said and walked away. I walked away wanting only to remember the April day the cross first stood center in the church. The answer to every question. The upward plank still speaks each Sunday , every Sunday, of how much we need our savior. And the reaching planks , where His arms bore the nails, speak of how much we need His Love for one another. What joy set before Him compelled His outstretched arms of Love for this church? How generous His Spirit for every dead church to become a LIVE and WELL church beneath These arms! “Where’s Jesus ? He’s not on the cross” the little child asked , yesterday , on Pentacost Sunday. And yes, Houston,” every church needs a cross. “And every cross needs a church. Thank you dear brothers Roland and Houston for your obedience to the cross. … an obedience that gave THIS CHURCH A CENTER and the center is THE CROSS. Romans 8 :22 For we know that the whole creation has been groaning together like in pains of childbirth for the revealing of the sons of God. Ephesians 5:27 So that he might present the Church (HIS BRIDE) to Himself in splendor without spot or wrinkle or any such thing, that she might be holy and without blemish. I Corinthians 1:2 To the church of God that is in Corinth , to those sanctified IN JESUS CHRIST call to be SAINTS TOGETHER with all those who in every place call upon the NAME of OUR LORD Jesus Christ both their LORD and ours. 1 Corinthians 1:18 For the MESSAGE of the cross is foolishness to those who are perishing but to us who are being saved it is the power of God. The letters to the Corinthians are loving instructions to a congregation who was born again as new creatures able to live free of what the ancients called “the seven deadly sins” that the enemy uses to kill God’s children. My brother named John Calvin long ago among others incited hostility against the physical image of the cross. He stated that it was” impossible to visually depict God who is invisible and transcendent therefore it is idolotry” This teaching resulted in the destruction of many crosses and art inspired by the Holy Spirit to draw sons and daughters to a deeper love for the invisible three in one reality of the Father, the Son and the Holy Ghost. Brother Calvin and I are no longer friends on this matter. I have seen again and again the cross is an visible though perishable reality of an invisible imperishable reality. And that reality is the GOSPEL. 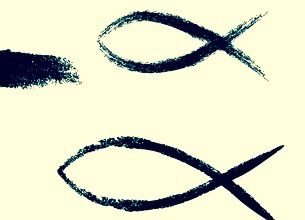 Colossians 1:15 Jesus is the (ONLY) image of the invisible GOd the firstborn of all creation. For by Him all things were created, in heaven and on earth visible and invisible . . . all things were created through Him and for HIm! The caption on the back of the “Renewed Life Outreach Center” T-shirt reads “Touching Heaven changing Earth” . It speaks of our upward reach like the upward beam of the cross to Heaven and our outward reach in heavenly blessings as the outward beam of the cross to one another and the community. Finally Hebrew 12:2,12 we LOOK TO JESUS THE AUTHOR AN FINISHER OF OUR FAITH, WHO FOR THE JOY THAT WAS SET BEFORE HIM ENDURED THE CROSS DESPISING THE SHAME AND HAS SAT DOWN AT THE RIGHT HAND OF THE THRONE OF GOD. . . . THEREFORE STRENGTHEN THE HANDS WHICH HANG DOWN AND FEEBLE KNEES AND MAKE STRAIGHT PATH FOR YOUR FEET SO THAT WHAT IS LAME MAY NOT BE DISLOCATED ED BUT RATHER HEALED.